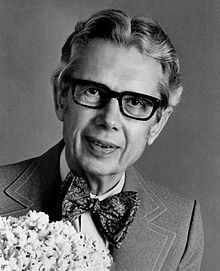 Orville Clarence Redenbacher (July 16, 1907 – September 19, 1995) was an American businessman. He was most often associated with the brand of popcorn called Orville Redenbacher's. Redenbacher was born on July 16, 1907 in Brazil, Indiana. He studied at Purdue University. Redenbacher was married to Corinne Strate from 1928 until her death in 1971. He was married to Nina Redenbacher from 1971 until her death in 1991. ↑ Thomas, Robert (September 21, 1995). "Orville Redenbacher, Famous For His Popcorn, Is Dead at 88". The New York Times. p. D20. This page was last changed on 31 August 2017, at 09:18.